Click on a region name (above) to view the list of some provincial parks that offer these opportunities. recommended since the number of canoes per day is restricted in order to reduce impacts on the park. 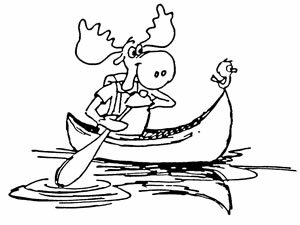 A pre-trip booklet, paddling skills guidelines, code of ethics and questions regarding the Canoe Circuit should be read prior to making a reservation. Flat Lake Provincial Park - The park is about 20 km southwest of 100 Mile House. Flat Lake provincial park features many small, interconnected lakes and canoeing is the best way to see its series of small lakes. The park is locally popular as a destination for one-to three-day canoe trips. To paddle the entire chain usually takes two days. Kayaking is possible, but more tiring since portages are frequent. Moose Valley Provincial Park - The park is located approximately 31 km west of 100 Mile House off Hwy #97. The park protects a chain of 12 small lakes, and canoeing along the Moose Valley Canoe Chain is the primary recreational activity. The canoe route is popular for day and overnight trips. Wilderness, backcountry or walk-in camping is allowed, but no facilities are provided. Nazko Lake Provincial Park - The park is located in the northern part of the Chilcotin Plateau northwest of Alexis Creek off Hwy #20. Nazko Lake Canoe Chain has a small chain of lakes, ideal for a 2-4 day canoe trip. This 20 km route spans six lakes (Deerpelt Lake, Nazko Lake, Tanilkul Lake, Nastachi Lake, Tzazati Lake and Tchusiniltil Lake) and has short, easy portages. There are no facilities on the canoe chain but there are two rustic, vehicle-access campgrounds at Loomis and Deerpelt Lakes. Tweedsmuir (South) Provincial Park - Tweedsmuir (South) Provincial Park is partnered with Tweedsmuir (North) Provincial Park. South Tweedsmuir is located on Highway 20, approximately 400 kilometres west of Williams Lake, midway between Anahim Lake and Bella Coola. Because there is no road access, paddlers must either hike in or charter a floatplane to fly in. The Turner Lake canoe circuit offers a three to five day canoe trip through spectacular mountain scenery. The canoe chain comprises of approximately 18 km of lakes and 2.5 km of rivers and creeks. The portages are short, with the longest being one kilometre. You should be experienced in wilderness travel, fit and well equipped. Snow is possible any month of the year in the mountains. 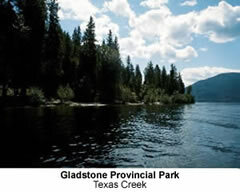 Gladstone Provincial Park - The park is located approximately 20 km northeast of Grand Forks on Hwy 3 at the north end of Christina Lake in the Monashee Mountains. The warm, clear water of Christina Lake is ideal for canoeing and kayaking. The park includes numerous sandy beaches on the west side of the lake that are accessible only by boat and make perfect picnic spots. Kikomun Creek Provincial Park - (canoe rentals available) Canoeing is welcomed on Surveyors Lake within Kikomun Creek Park. A concrete slab boat launch is located on Lake Koocanusa. The drop off can be steep during low water periods. Boat launch access is open year-round. Golden Ears Provincial Park – Golden Ears Provincial Park lies in the Coast Mountains 11 km north of Maple Ridge on the north side of the Fraser River. As one of the largest parks in the province, this park is prized for its recreational opportunities. Canoeing and kayaking are very popular on Alouette Lake, as well as other water activities such as swimming, windsurfing, water-skiing, boating and fishing. Canoe/kayak rentals are available in the Alouette day-use area. Sasquatch Provincial Park - Located north of Harrison Hot Springs, Sasquatch Provincial Park is characterized by a series of pocket lakes, a unique second-growth and birch forest, and scenic mountain ridges. Hicks and Deer Lakes are ideal for canoeing and boating. There are commercial canoe rentals available at Hicks and Deer Lake. Babine River Corridor Provincial Park – This park hugs the Babine River for 85 km north of Smithers and Telkwa. There are internationally significant rafting and kayaking opportunities - do not underestimate the challenges of this river. It consists of 30 km of Class III and IV rapids and can be very treacherous. Guided trips are available through local rafting companies or individuals may plan private trips. Carp Lake Provincial Park - Carp Lake Park is 141 km northwest of Prince George and the main access road to the park joins Highway 97 at the community of McLeod Lake. Canoeing and kayaking are very popular at this park. The Islands offer backcountry camping and you can register at the boat launch at Carp Lake. The Lake is subject to high winds and consequently rough waters which can be responsible for swamping the unwary. Watch the weather and always wear life-jackets. Finger-Tatuk Provincial Park – This park is located 80 kilometres south of Vanderhoof and 115 kilometres southwest of Prince George. Finger-Tatuk provincial park has a beautiful series of lakes providing opportunities for canoeing or kayaking. There are rustic recreation sites available for camping. and Tezwa River. The area is accessed by boat to the head of the Gardener Canal. Visitors should be experienced in ocean navigation and wilderness survival. Visitors can use jet boats to access Kitlope Lake and Kitlope River systems. Kleanza Creek Provincial Park - Kleanza Creek Provincial Park is located amongst the forests and rock canyons in the Coast Mountains. There are whitewater-kayaking opportunities in Kleanza Creek. Please use caution. There are no rentals available at this time. Lakelse Lake Provincial Park - Lakelse Lake Provincial Park is situated in the Skeena River Watershed and is surrounded by the mountains of the Kitimat Range. Canoeing, as well as windsurfing and sailing are popular activities on Lakelse Lake. No rentals available at this time. Stuart Lake Marine Provincial Park -The Stuart-Trembleur-Takla Lake boating system is located in north central British Columbia and comprises nearly 300 km of waterway. The long, narrow lakes are among the region's most significant. Takla Lake Marine Provincial Park - The Stuart-Trembleur-Takla Lake boating system is located in north central British Columbia and comprises nearly 300 km of waterway. The long, narrow lakes are among the region's most significant. Trembleur Lake Marine Provincial Park - The Stuart-Trembleur-Takla Lake boating system is located in north central British Columbia and comprises nearly 300 km of waterway. The long, narrow lakes are among the region's most significant. Bear Creek Provincial Park - (kayak rentals available) Enjoy excellent boating in the waters said to be home to the legendary Ogopogo. E.C. Manning Provincial Park - (canoe and kayak rentals available)E.C. Manning Park (hereinafter called Manning Park) is a focus of outdoor recreation that is unique in British Columbia. Located in the heart of the Cascade Mountains it is within a three hour drive from either Vancouver or the Okanagan. The climate and geography have combined to make this park an all season recreation area. There are canoeing and kayaking opportunities on Lightning LakeCanoeing at Lightning Lake is the most popular boating activity in the park. non-motorized boating in the Lightning Lakes chain. Sun-Oka Provincial Park - (kayak rentals available) Located just south of Summerland, this is one of the most superb beaches in the entire Okanagan. The name is shortened version of "Sunny Okanagan." The park provides outstanding beach, waterplay and picnic opportunities as well as fantastic views down Okanagan Lake. Bonaparte Provincial Park - The park is located on the Bonaparte Plateau south of Bonaparte Lake, approximately 55 km northwest of Kamloops. The many small lakes on the plateau are popular with canoeists and kayakers. Note that portages are not maintained. Only very rustic camping sites exist, so visitors must be self-sufficient and be prepared for wilderness camping. Lac Le Jeune Provincial Park - The park is nestled amongst lodgepole pine, spruce and fir, is an easily-accessible getaway spot. The park provides access to Lac Le Jeune which epitomizes the plateau lakes of the Kamloops region and is provincially famous for its rainbow trout fishery. Camping, fishing, canoeing, boating and nature studies are traditional uses of the park. Mount Robson Provincial Park - The park is located in east, central British Columbia, just west of the British Columbia/Alberta border and Jasper National Park. Mount Robson Provincial Park comprises a portion of one of the world's largest blocks of protected areas. Canoeing and boating are suitable on Moose, Yellowhead and Whitney Lakes but use caution as the lakes are subject to strong winds. A number of rafting companies operate in the area along various sections of the Fraser River. Paul Lake Provincial Park - This lovely lakeshore campground is within a half-hour drive of Kamloops. Paul Lake with its clear, deep waters and scenic setting of forested mountain sides provides easy access to a diversity of outdoor recreational activities. This park offers a lovely beach, campground, group use camping and picnic areas for visitors and local residents to escape the hot valley bottom conditions in summer and enjoy the cooler air and canoeing and boating in the clear cool waters of the lake. Roche Lake Provincial Park – The park is located 36 km southeast of Kamloops, accessed via gravel road from Hwy 5A at the north end of Trapp Lake. Canoeing and kayaking are popular on the seven lakes. Small, user-maintained, rustic campsites are located on two of these lakes. Taweel Provincial Park - The park is accessed via a gravel road from Highway #24, 20 km west of Little Fort. A picturesque large lake, connected with a trail network to smaller lakes, in an area noted for canoeing, kayaking, fishing, hiking, and nature appreciation in a wilderness setting. Note that there are no camping or day-use facilities provided, and there are private resorts and cabins on Taweel Lake. Wells Gray Provincial Park - Murtle Lake in Wells Gray Provincial Park is world-famous as the largest canoe-only lake in North America. Set in a pristine mountain valley, the north and west arms are approximately 20 km long, and the lake averages three kilometres wide. The park can be accessed off Hwy #5 at Clearwater or turn off Hwy 97 at 100 Mile House for the Mahood area of the park. There are four areas of the park that offer excellent canoeing and kayaking opportunities – Murtle Lake, Clearwater/Azure Marine, Mahood Lake and the Corridor area. Schoen Lake Provincial Park – Schoen Lake Provincial Park is located 140 km north of Campbell River on Vancouver Island. There are canoeing and kayaking opportunities at this park on 5-km long Schoen Lake. Paddlers can set in at a rough boat launching area, located at the Schoen Lake campsite. Wilderness, backcountry or walk-in camping is allowed, but no facilities are provided. Strathcona Provincial Park - Canoeing and kayaking is popular on Buttle and Upper Campbell Lakes. Buttle Lake is subject to strong afternoon winds that may be very hazardous to small craft. Canoeists and kayakers should exercise caution at all times. There are many kayaking/canoeing opportunities in our provincial parks and protected areas. Weather conditions can change at any time; be prepared for any unexpected circumstances when undertaking any major water trip. Anyone contemplating an extended or overnight trip should inform a friend or family of their intended route and anticipated return time. Camp in designated sites if available; otherwise, choose an area with limited impact such as gravel or small rocks. Build a fire only if necessary; recommend bringing a stove whenever possible. Dispose of human waste carefully. If toilets are available, please use them. Otherwise, dig a hole at least 30 metres from water. Pack out what you pack in. Never bury your garbage. Never throw in the water. Respect our incredible diversity of plants and animal life with respect. Enjoy exploring our beach but do not remove anything including kelp, driftwood, rocks, sand, etc. – these are critical nutrients for other food chains. Enjoy viewing wildlife but recognize and respect the needs of wild animals in their natural habitat. Never approach wildlife, avoid noises that might stress animals, never feed them and keep pets on a leash or avoid bringing pets into sensitive wildlife habitat areas. Respect the rights of other water users, other recreationists, fishers and those who make a living on the water. For more detailed information on the Code of Ethics for Water Recreationists, click here. please leave it as you found it so that future visitors may also enjoy the park.